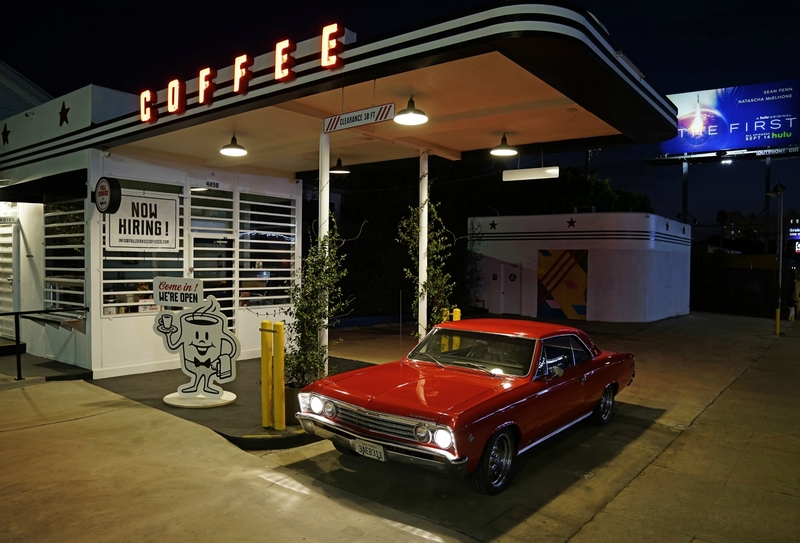 Good coffee is pretty abundant in L.A. Good coffee you don’t have to get out of your car for is harder to come by. 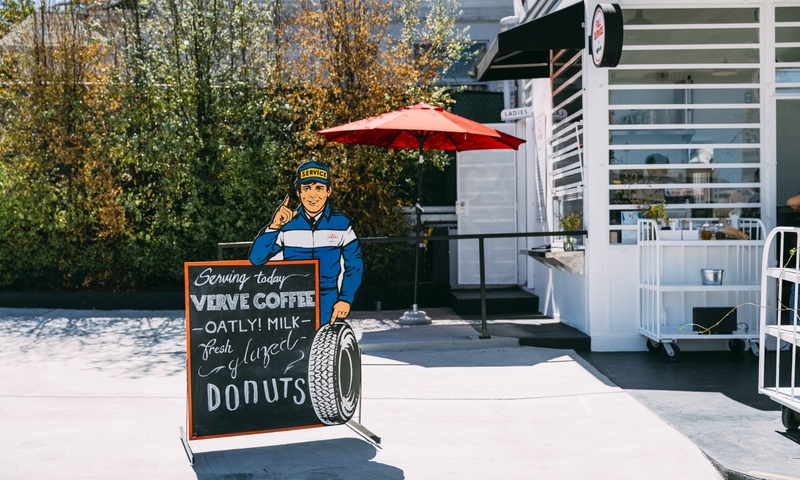 Partners John Juniper, Jeff Solorio, Edoardo Chavarin, and Benjamin Montoya set out to fill that gap with Full Service Coffee Co., a charming new drive-up coffee shop in a converted service station in Koreatown. The building itself is may be as much a draw as the concept. Built in 1941, the former Texaco gas station had been empty and fenced off for several decades, until a Christmas tree nursery began setting up shop outside the space during recent holiday seasons. As years went by, the Streamline Moderne building became somewhat iconic, despite (or perhaps because of) its vacancy. And for two decades, Juniper and Solorio—who co-founded and design for the sunglasses brand DITA—always wondered “what if” as they drove past the building during their daily commute. “We always kind of talked about it. We always said this would be a perfect place for a drive-up coffee shop,” says Juniper. It was only two years ago that a sign with a phone number popped up on the property, and they immediately picked up the phone and jumped on the opportunity. 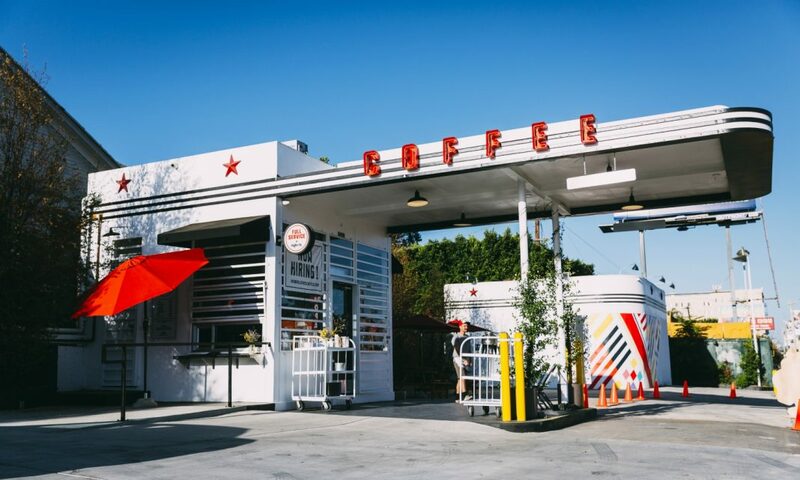 Enlisting the help of Chavarin, who has a branding firm that works with high-profile clients like Coachella, and Montoya, who also works in the eyewear industry, they began the process of turning a decades-vacant gas station into a coffee shop. Their first concern was getting a change of use permit, which was required in order for them to sell food and beverage rather than gasoline. “We had to show the tanks were removed, and there’s no chemicals, no gases or anything,” says Chavarin. Physically removing the tanks wasn’t the issue—that project had been undertaken long ago. The problem was that it had been done so long ago, there were no digital records to prove the tanks were ever taken out, so the partners were tasked with finding the physical paperwork. After a three-month wild goose chase with a lot of detective work and a few favors from friends and from the fire department, they got lucky and located the permits “in some closet,” says Juniper. Getting a building that dates to 1941 up to code wasn’t an easy feat either. The rebuild covered everything from the plumbing to the electric and even the meters on the street. “That was kind of expected, being an old building. It took us about nine to ten months of planning and then about a year of construction,” says Solorio. The authentic vintage aesthetic that they created transformed the corner of Beverly and Hobart into an Instagram destination even before any coffee was poured at the location. Earlier this year the captivating “COFFEE” signage went up on the porte-cochère, and months before the shop was open, Chavarin says he received numerous messages requesting to leave the signage lights on from people just wanting to take photos of it. The property was still fenced off and closed to the public, yet pics of the shop had been circulating social media since early spring this year, creating an aura of mystery and allure. To add to the mystery, several prospective opening dates came and went (we reported it as early as fall 2017). 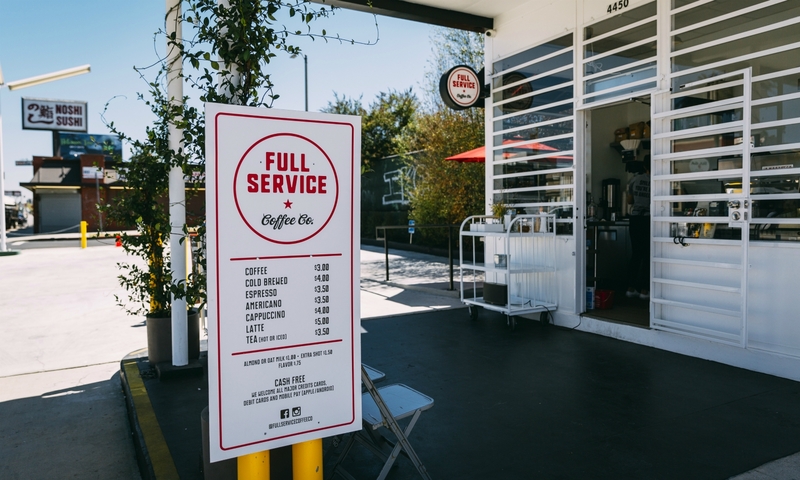 Full Service Coffee Co. became one of the most anticipated coffee shops in L.A.
On September 1, two years after starting the journey, the shop finally opened. “That little tin box looks so innocent and so beautiful, but it really kicked our butts for the better part of two years,” says Chavarin. Their coffee shop aspirations don’t stop at the curb though, and the partners say this is just phase one. Phase two is opening up the other building on the property—tin box adjacent—and possibly selling desserts and pastries. (Currently, it serves as a canvas for artist Teddy Kelly’s colorful geometric mural.) They hope to open more Full Service Coffee Co. locations, but for now, they say they’re having fun learning as they go. RELATED: Will Silver Lake’s 1940s Texaco Be Saved From Demolition? Next articleThe Duo Behind the Tonya Harding and Nancy Kerrigan Museum Are Bringing a Grey’s Anatomy Exhibit to L.A.